The Allen Morris Company proudly announced today that they have closed on a $90 million construction loan for Star Metals Residences, the residential component of the comprehensive and highly-anticipated mixed-use community, Star Metals Atlanta, in West Midtown Atlanta. Construction has begun on the residential phase of the project and site work is expected to commence on the office phase during the first week of August. 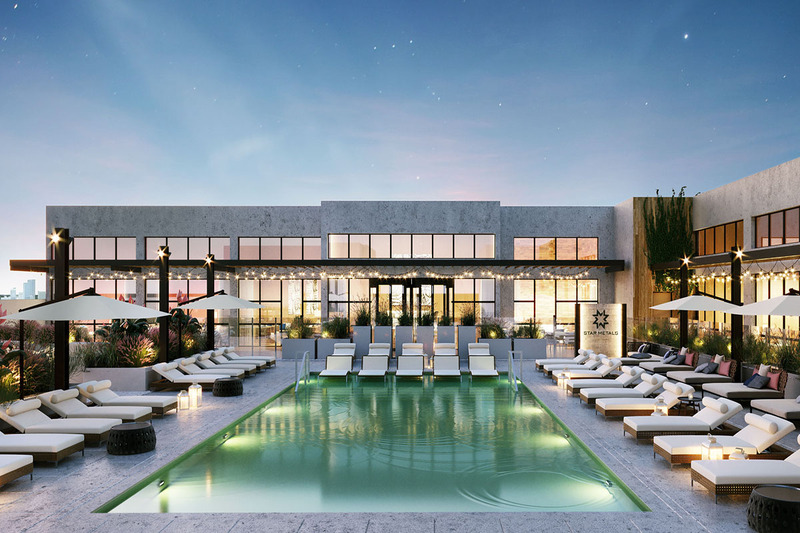 Square Mile Capital Management LLC and Pacific Western Bank provided $90 million in financing on the 409-unit luxury rental apartment building that will also include 16,300 square feet of retail. Juneau Construction is the contractor for Star Metals Residences and Brasfield & Gorrie is the contractor for Star Metals Offices. Located at 1050 Howell Mill Road and designed by Oppenheim Architecture and Dwell Design Studio, with interior design by Square Feet Studio, Star Metals Residences offers its residents modern living spaces and impressive double height, curtainwall glass lobby activated with high-end F&B concept. Residents will also enjoy an unparalleled array of ground floor amenities including a private outdoor dog run, interior dog wash area, Uber drop-off room for residents, package delivery to the resident’s door, and resident library with fireplace. Additional amenities on the Level 9 Rooftop include lounge/meeting rooms, indoor/outdoor activated rooftop bar & lounge, game room area with pool table, gaming systems and arcade games, outdoor ping-pong and bocce ball, a glass-box fitness center opening onto the pool terrace, outdoor grilling area, outdoor movie projection area, outdoor fire pits and seating groups. The visionary Star Metals Residences is part of the transformative 4.75-acre Star Metals Atlanta development that also includes Star Metals Offices, the 14-story, Class-A office tower totaling 260,000 square feet that includes 35,000 square feet of retail and restaurants. The significant project milestone comes on the heels of the signing of new tenant, Spaces, a pioneer in creative and flexible workspaces. Signing 56,121 square feet of space at Star Metals Offices, Spaces will occupy the building’s 7th and 8th floors and includes a 5,642 square foot ground floor reception area and private Business Club fronting Howell Mill Road, along with more than 8,000 square feet of amenity-rich, outdoor landscaped private terrace collaboration and meeting areas for Spaces clients. With a 60 year history in the real estate industry, including 19 projects in the Atlanta area, The Allen Morris Company is excited to deliver Star Metals Residences which will become the Company’s 83rd overall development. Star Metals Residences is slated for delivery in Spring 2020. The Allen Morris Company is one of the largest real estate firms in the Southeast U.S. specializing in commercial, multi-family residential and mixed-use developments, leasing and brokerage as well as property management. With offices in Miami, Coral Gables, Fort Lauderdale, Orlando, Jacksonville and Atlanta, The Allen Morris Company has served its business and investment clients for 60 years. For more information, please visit www.allenmorris.com., or follow us on Facebook at www.facebook.com/TheAllenMorrisCompany or on Twitter @allenmorrisco. Square Mile Capital Management LLC is an integrated institutional real estate and investment management firm based in New York. The firm’s commercial real estate debt platform provides customized capital solutions for real estate assets throughout the United States. Square Mile Capital’s equity platform takes a value-oriented approach to its investment activities, with an emphasis on opportunities to invest in real estate assets or enterprises that are undervalued, complex or under-capitalized. Pacific Western Bank is a Los Angeles-based commercial bank with approximately $24 billion in assets. The Bank has 74 full-service branches located throughout the state of California and one branch in Durham, North Carolina. We provide commercial banking services, including real estate, construction, and commercial loans, and comprehensive deposit and treasury management services to small and medium-sized businesses. We offer additional products and services through our CapitalSource and Square 1 Bank Divisions. Our CapitalSource Division provides asset-based, equipment, real estate and security cash flow loans and treasury management services to established middle market businesses on a national basis. Our Square 1 Bank Division offers a comprehensive suite of financial services focused on entrepreneurial businesses and their venture capital and private equity investors, with offices located in key innovative hubs across the United States. For more information about PacWest Bancorp, visit www.pacwestbancorp.com, or to learn more about Pacific Western Bank, visit www.pacificwesternbank.com.